When we were in Lausanne for a couple of nights on our trip, we realized that we could get to France in only 30 minutes by ferry!! How amazing is that? Naturally, in order to feel way more cultured than we really are, we immediately high-tailed it over to Evian, France for a little day trip. After purchasing a "European Man's Wallet" for 10 Euro for Grant, then immediately realizing that it was made of plastic and smelled like gasoline, we stumbled upon this little gem of a spot for lunch. 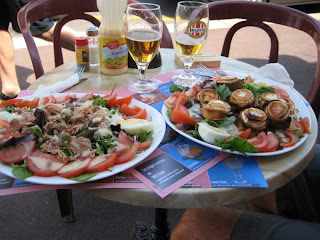 After about 7 days of eating Schnitzel and Brats, we were delighted to find salads on the menu! And not just any salads, my favorite kind! Nicoise Salad, which I was shocked to discover has rice on it when made authentically in France. Grant got a salad, on the right below, with goat brie broiled on mini baguette pieces. It was out of this world! Then again, most things with melted cheese are. I attempted to recreate a few elements of the salads we'd had all throughout the trip last night, in an effort to eat lots of vegetables. Hmmm, somehow it doesn't look quite the same! Oh well, still tasty...kind of. At least I am eating more than meats and cheeses this week. My version. Not the same.